Anxiety is a kind of vogue diagnosis. A lot of people have anxiety, it seems. There is a mental health movement right now, and anxiety has become quite vogue. A lot of people have anxiety. I like this graphic because it illustrates a lot of different people who suffer from anxiety, although, of course, even this is limited in its scope. Everyone experiences periods of anxiety, regardless of their clinical or mental health history. This does not mean that everyone has an anxiety disorder, of course, but stress is a normal part of life and anxiety is simply a heightened form of stress. Some people have anxiety disorders. Some people don't. But everyone experiences stress and anxiety at some point, so it really shouldn't be hard for us to all understand each other. I have an anxiety disorder. I also have Sensory Processing Disorder, OCD, ASD, and I have experienced periods of clinical depression. My fiance has none of these diagnoses, but he sometimes finds his schoolwork extremely stressful. It is hard for him to understand when I get anxious about little things, like germs and plans and unlikely consequences of my choices, but he kind of understands, because he has experienced minor anxiety about his schoolwork. Anxiety is bad for you. I really like that graphic above, because it shows how anxiety can effect all body systems - which it absolutely can. Stress is - to a point - good for you, but anxiety - but when that stress heightens to clinical anxiety, it is bad. It is bad for you mentally, but it is also bad for you physically, which is important to understand. 1. Everyone experiences stress, but anxiety is not normal, the number of people diagnosed with a true anxiety disorder is quite the minority. 2. 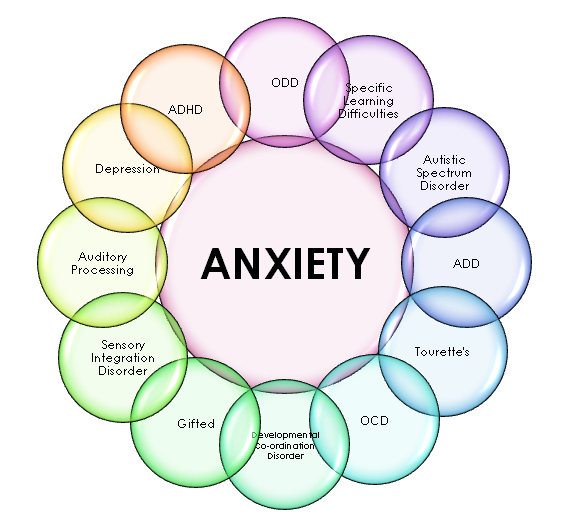 Anxiety is real and those who suffer from anxiety disorders can be quite distressed by anxiety. 4. Anxiety is bad for your body. PS - I jest-fully talked about anxiety a few weeks ago, here. Today I am so thankful for the Circadian Rhythm. The Circadian Rhythm is a body response that regulates a series of basal actions, including the sleep cycle. Despite my three years of a science degree, I don't remember a whole lot about the Circadian Rhythm, but I know that part of it is the body's "internal clock." I've been working a lot of evenings recently, and I had a night shift Wednesday that I haven't fully recovered from. I've also been working every day, many hours a day. Plus I'm entering the last weekend of a course that I'm taking, which is really stressing me out because I haven't had the chance to do all my work yet. I still have a few things to study and 15 pages of a paper to write! I am really paranoid about the paper, but I'm also exhausted. I'm trying to fight the Circadian Rhythm - I have been trying to do so since I got off work at midnight on Tuesday and then when I stayed up all night to work on Wednesday. But I'm so tired. I'm so tired, and I have to work tomorrow morning. Thank you, Circadian Rhythm, for reminding me that sleep is good. I have been increasingly anxious in the last few weeks and months. I'm not really sure how to deal with it. Sometimes, I just have to make fun of myself. 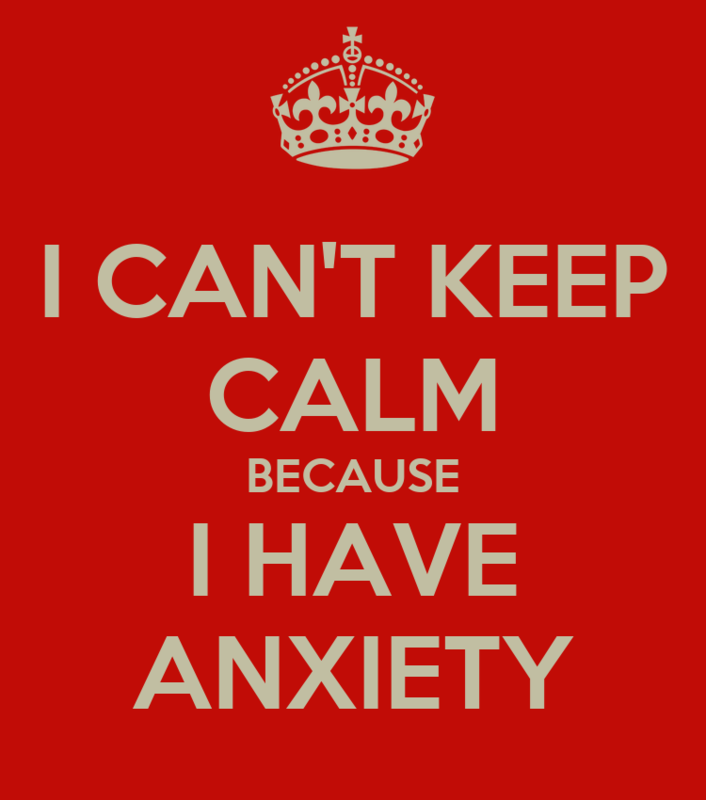 I can't keep calm because I have anxiety. My fiance just called me. He'd been called to "pre-marital counselling detention" (as I called it), but more specifically, our pastor had asked to have a private meeting with him. We've both been speculating for a few days over what would be discussed in this meeting. We had a lot of ideas. But we were totally wrong. He wanted to talk about my Asperger's. I wasn't even there (he specifically asked my fiance to meet him privately) to discuss my brain. I haven't gotten the whole story yet, but I'm upset about that. I'm upset because, frankly, I don't know if he would know that I was Autistic if my fiance and I had not disclosed it to him, a long time ago. He's strangely preoccupied with my brain though and at our other pre-marital counselling meeting, he asked about it a lot. I don't mind when people ask questions about my brain, but I'm not keen on people asking questions about my brain from people who don't know what they're talking about. My fiance knows a lot about me and a bit about autism, but he's not the expert. If anyone's the expert, it's ME. What did the pastor ask about? Well, he just mentioned to my fiance that marriage spiced with Asperger's will have its own unique challenges and life might be hard for us. But isn't life hard for everybody? He said that - since I apparently give less facial information than neurotypical people - I might in some way hinder my children's development. WHAT? My fiance and I really look forward to having kids, so this definitely peeved me. I don't want to hear this man's backward explanation of my brain and how he thinks I'll somehow screw up my children because I apparently don't have an expressive face! That is absurd and judgmental and makes me feel really bad about myself. He also suggested that we visit a medical doctor (as a couple) to talk about Asperger's. As if I've never visited a doctor about my brain before. As if I've never seen a neurologist. As if I haven't had years of cognitive behavior therapy. As if I haven't seen all the specialists in pediatric autism Toronto, Ontario (at SickKids, CAMH, Geneva... I've seen them all). As if I haven't read books and befriended other Autistic kids and been in special education and gone to extracurricular programs with other Autistic people. I KNOW HOW AUTISM WORKS. And even more than that, I'd like to say that I'm the most knowledgeable person about my own brain. I fully think it would be great if my fiance had a better understanding of autism, but I think it's more important that he understands me, and I'd like to think that when he looks at me he sees more than a diagnosis I received at nine years of age. I can't go back and "fix" my brain or change it in some way so I don't have this condition. This is how I was built and I'm OK with that. I actually like my brain and don't see it as a liability. But when people like this pastor treat it like it's some sort of huge problem and obstacle that we have to overcome, it makes me feel really inadequate, like autism is a bad thing. Autism is not a bad thing. Autism is not a punishment. Not for me and certainly not for my fiance. Autism is a small portion of my life and an even smaller portion of his life. When my fiance mentioned that the pastor said he should find a support group for other people married to Autistic individuals, I thought that was a good idea, but I retorted back that I want a support group for Autistic people married to neurotypicals, because even though I know I can be annoying sometimes, neurotypical people can definitely be an annoyance to me. I am smart enough to see ignorance when it is near me, and frankly this small town I currently live in is full of it. I'm really frustrated that this man is so preoccupied with my brain chemistry that he can't see through that and to all of my good qualities. All I want to do is be happy in my marriage. Isn't that what everybody wants, whether they're Autistic or neurotypical? Next time, I really hope he asks me about my brain instead of asking my fiance, and next time I hope he gets to know me before expressing his concerns about how an Autistic person could possibly exist independently in the world. My fiance is the love of my life. I adore him for many reasons, and sometimes the cardinal reason I love him is that he puts up with my "crazy." Note: I started this post with the intention that it would be a positive picture of my relationship and the small part of it that is my neurochemistry, but every time he and I argue about something, it all seems to come back to the fact that we don't think in the same way, and that is what causes our conflicts. I love my fiance so much and want our relationship to be perfect. I will do anything to make our relationship successful. And yet sometimes I feel so unequipped because my brain doesn't work the same way his does. Sometimes I just need reassurance that we can be happy and successful, fifty years from now, even though our neurons behave in different ways. So this will be "Part 1" in a series about Me, My Fiance, and My Autism. I knew that, in order for any romantic relationship to work, I would need to be upfront and honest about my autism. I had been in disastrous relationships before that were unhealthy and unproductive and downright unpleasant, and I knew that for a relationship to work, I would need to be completely honest about who I am and what I need. My first breakup was really hard on me (even though the guy was completely wrong for me, but of course I couldn't see that then) and I definitely didn't want to go through another miserable breakup again. When I first met my fiance, we talked a lot. We used to talk on the phone, actually, and I remember telling him in one of our earliest conversations that I was diagnosed with Asperger's Syndrome when I was young. I was surprised when he just sort of brushed over it and didn't make it into a big deal. For so long, I had been ashamed of my autism, so the fact that my partner was okay with it made me feel much more confident to be myself and not to try to hide my real personality from him. I think this is going to be a pretty long series about Me, My Fiance, and My Autism. I will try to discuss conflict, how we make our relationship work, how we support each other, how we respond to what is important with the other person... If you're particularly interested in any of the above, please let me know -- I haven't started writing any of them and they're all up in my head somewhere, but that's it for the moment. Also: I would love to answer questions about my relationship and my autism. If anyone has anything they would like to ask, please go ahead! I don't have children yet, and when I do, I will doubt that I will name them based on their astrological sign. I don't know much about astrology, but I do know a lot about names. Here's a a quick review of the astrological signs and some info about them, if you don't know this stuff. I got this chart from this website. One of my favorite things about this chart is that it gives you some ideas to consider if you want to choose a name that is significant to the zodiac. For example, you can use a name that reflects the element of the sign (eg. "Terra" is an earth name, so it would be appropriate for an earth sign). You can also use the personality traits or planets to derive names of significance; maybe pick a name with a meaning that reflects the personality traits of specific astrological signs. This page also offers some suggested beginnings for names that would "bring luck" to kids born during this time. I like names. I like the freedom of names that's reigned in by the pattern of it all. I like name guidelines, but I also like the ability to choose that names allow. This is kind of a useless post. I guess it's just kind of a "for your information" kind of situation. I like names. I guess that's it. I have an obsession with names.